Using the JustRite Christmas Treasures and the Starry Night Technique from TJNL CD7, I created this beautiful background for a quick beautiful Christmas card. Christmas Treasures is a wonderful set of 4 Christmas Centers and Borders that fit on the 3-1/4" Wooden Stamper. 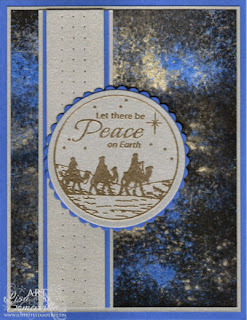 Here I Gold embossed the image on Gold Card stock, cut with Circle Spellbinders Dies, then layered on a Blue Scallop. I added some paper piercings along the Gold panel under the image, layering on a piece of Blue then Gold card stock, then adhere to my Starry Night Background. Don't you think the background is just perfect for this JustRite Christmas image. I'll be posting another peek at a TJ CD7 Technique tomorrow during the TJNL Designers Blog Hop. The JustRite Designers will be joined for a Mega Font Hop on September 17th and 18th, so mark your calendars! Definitely the right tech for the stamp! Wowza Lisa, what a way to sell the CD!